Brisbane, August 2 (2014), Alochonaa:In the past months the European Union has once again displayed an inability to make significant decisions or take decisive, united action in response to the Ukraine crisis. Whilst several member states have taken diplomatic action in an attempt to resolve the crisis in Ukraine, the actions taken by the European Union have been indecisive. This is not the first time that the EU has failed to act in a united manner; unilateral action and inaction during the Libya crisis come to mind. The issue at hand is clear. Even following the ratification of the Lisbon Treaty, the European Union fails in times of crisis to take united, decisive action in a timely manner. As a result the power and credibility of the European Union as a political institution suffers. The EU is once again viewed as an institution with extensive economic power but little political capability due to its inability to make united decisions. Evidently, the gap between economic power and political power in the European Union still persists and is likely to grow. Faced with this gap, the political leaders are likely to find themselves in a ‘Stag-Hunt’ dilemma. If they attempt to run their foreign policies through EU channels there is a chance that something or nothing will be achieved. If, on the other hand, an EU member state acts unilaterally it might be able to create an effective policy but it will shoulder all the risks and costs alone. Adding to the problem is that eurosceptics are rapidly gaining ground on those supporting the EU within the member states’ governments, their voting populations and even those outside the European Union. There are a number of factors that can explain ongoing EU indecisiveness. 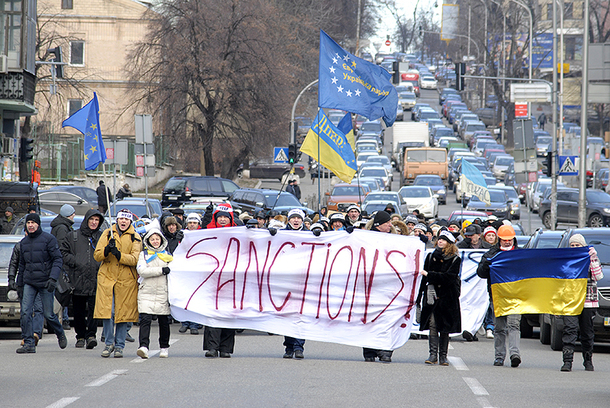 First and foremost, the differentiated national interest of member states prevents the Council from taking united action, especially in regards to Level 3 Sanctions – that is, those sanctions that actually impact entire industrial sectors. One of the most controversial of these sectors is the arms industry. While numerous countries have been supplying Russia and Ukraine with arms and military technology, two countries in particular – France and Great Britain – have drawn criticism for continuing the export of military equipment and technology, including game changers such as the French built Mistral helicopter carriers. The controversy over the delivery of the French carriers is evidence of increasingly diversified national interests within the EU as they related to the Ukraine crisis. Despite having drawn extensive criticism prior to the Ukraine crisis regarding the delivery of the two Mistral carriers to Russia, the French government decided to go ahead with the delivery of the first vessel (at least) despite criticism from fellow EU member states and other governments. The French government is arguing that revoking the export license – thereby suspending or even halting the export entirely – would not only threaten thousands of jobs but also jeopardise the credibility of its arms industry and worsen the likelihood of new purchases. Similarly, Great Britain has restricted only a few of its exports and allowed small arms and military equipment, such as night vision devices, to be delivered to Russia. In both cases it appears that the local economic interest, as well as the interest in continuing unilateral relations with Russia, seems to impact the decision making in both countries. Whilst Great Britain might not acknowledge economic interest publicly, France openly considers the issue of job safety and economic security of its arm industry more important than resolving the Ukraine crisis. Aside of the arms industry, other sectors, such as the car or the energy industry, could be heavily affected by Level 3 Sanctions. This is a worry for industry leaders and government officials alike in other EU member states, such as Germany. That said, European indecisiveness is not caused by differentiated national interests alone. The intergovernmental decision making process of the European Council, as well as the belief that Europe needs Russia more than Russia needs Europe, also affects EU decision making. The need for unanimous decision making on foreign affairs issues, even post-Lisbon Treaty, makes EU foreign policy negotiations time-consuming and difficult. However, the fact that Council decisions affect the European Union as a whole means that unanimous voting is considered necessary by most member states. Due to the different unilateral relations that numerous member states have with Russia or Ukraine, as well as the wide ranging political agendas of the heads of states and domestic governments, the decision making process is affected by an extensive number of variables. The question as to how much Europe needs Russia, and vice versa, is also affecting the ability to make decisions. Unlike in previous EU foreign policy disputes, there are many EU states which could be affected by prolonged negative relations with Russia. These factors relate back to differentiated national interests. Therefore, despite the size and importance of the EU, issues such as the political ideology of domestic governments as well as the economic, historical and political situation of its individual members will continue to influence the decision making in the European Union. This will be especially so in the European Council, making the foreign policy of the EU weak and indecisive. Looking Ahead: What could India 2020 look like?